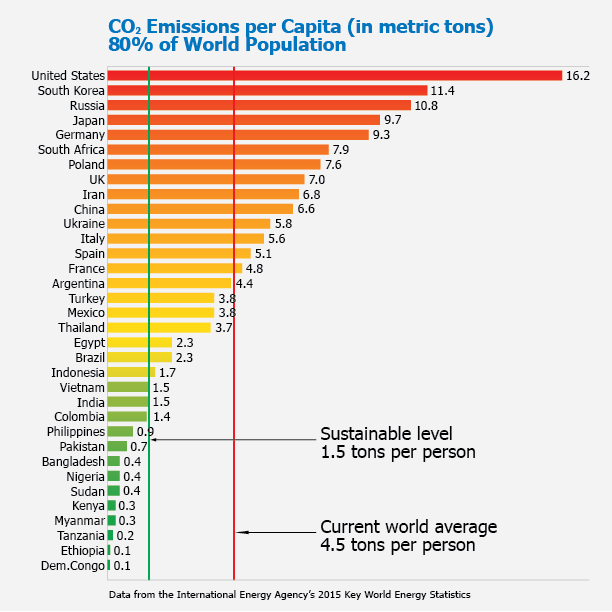 This chart shows the annual metric tons of CO2 emissions per person in the 34 most populous nations of the world, which include 80% of the world’s total population. 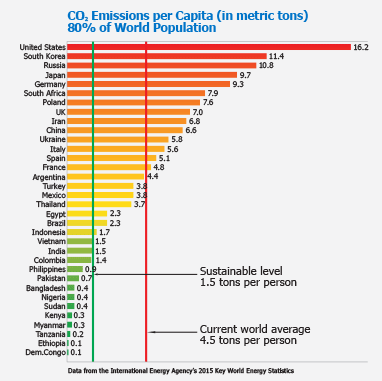 Annual per person CO2 emissions by country is a more important measure than total country emissions. Looking at this data from year to year indicates which nations are improving and at what rate. The vertical line on the right shows Current World Average CO2 Emissions per person per year – 4.5 metric tons. 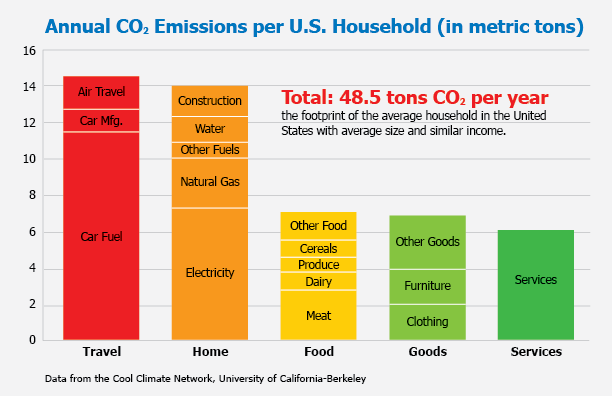 Annual U.S. CO2 emissions are 16.2 metric tons per person. The vertical line on the left, “Sustainable level 1.5 tons per person,” shows the average annual CO2 emitted per person if CO2 emissions are cut 80% by 2050, a goal agreed to by almost all nations. 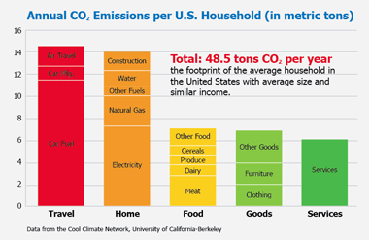 U.S. household emissions are 48.5 metric tons of CO2 per year (household average 2.6 people). If a family overspends its finances, it often creates a budget to make the necessary cuts. The same could be done with CO2 emissions. A personal CO2 budget can show which decisions will make the most difference. Plan Curtail provides the numeric information for such a budget along with methods for curtailing energy use. 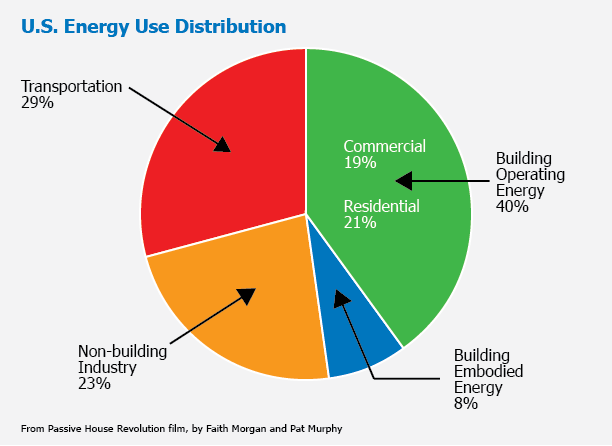 Plan Curtail provides the rationale and methodology for reducing home CO2 emissions from heating and cooling by as much as 80%. This is especially important, since the International Panel on Climate Change and most nations agree that an 80% cut in all emissions is needed by 2050. 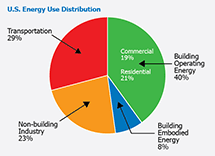 Our residences (homes and apartments) generate 21% of U.S. CO2 emissions, about 10.2 metric tons annually per residence. On average there are 2.6 people in a household. Plan Curtail can help drivers make well-informed choices when choosing low-emission vehicles. 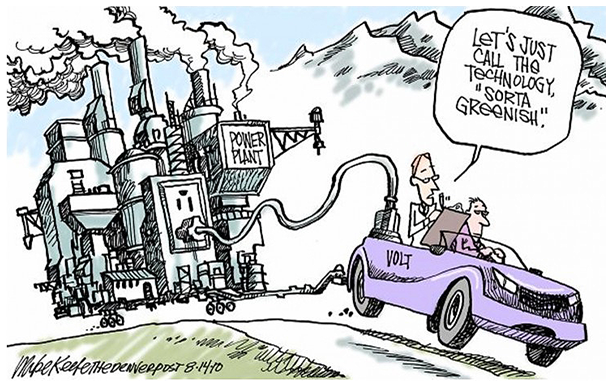 Cars generate close to a third of the CO2 in the U.S., about 4.5 metric tons per car per year. The population of cars in the world is increasing rapidly, making it ever more difficult to counter climate change. Worldwide 88 million cars were produced in 2014, bringing the total number of cars in the world to over one billion. Plan Curtail emphasizes the importance of dietary changes to achieve significant reductions in CO2 emissions from the production and consumption of food. 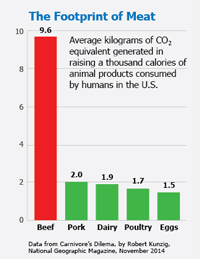 One of the main sources of greenhouse gas emissions from food is meat. 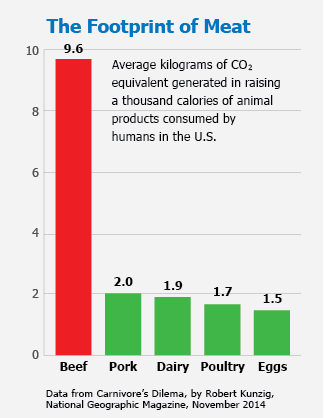 Beef alone accounts for more than pork, dairy, poultry, and eggs combined.